MANILA (FIBA Basketball World Cup 2019 Asian Qualifiers) - 2018 was a year of plot twists in Asian basketball, and those made a tremendous impact on our year-end power rankings. It's not that difficult to figure out which teams should be at the top tiers of these rankings, especially with three squads already qualifying to the FIBA Basketball World Cup 2019, but beyond those, it's pretty much a merry mix-up the rest of the way. This means that nearly every game from here on moving forward will have significant implications on who will book the final four FIBA Asia berths to China 2019. Basically, every game counts. Let's see where the teams stand. The Boomers are beating opponents to a pulp by an average of 32 points per game. Their only Asian Qualifiers loss was by the slimmest of margins to Japan. To say they have been dominant and a cut above the rest is an understatement. And we haven't even seen their truly elite players - Ben Simmons, Joe Ingles, Dante Exum, Patty Mills, Aron Baynes - suit up yet. As is, Australia are too good for anyone at the Asian Qualifiers. This is a team with the potential to finish on the podium at China 2019. The Tall Blacks didn't get their Asian Qualifiers off to a running start when Korea tripped them in Wellington last year, but they haven't lost a game since. Now, New Zealand haven't been as dominant as Australia - a near-loss to Lebanon at home stands out - but we cannot sleep on a 9-game winning streak. Coach Paul Henare's wards have a great array of size, strength, shooting, playmaking and defense. This is just a very very solid team. I'm not sure if they'll be as successful at the World Cup, but they have the raw materials to make some noise. 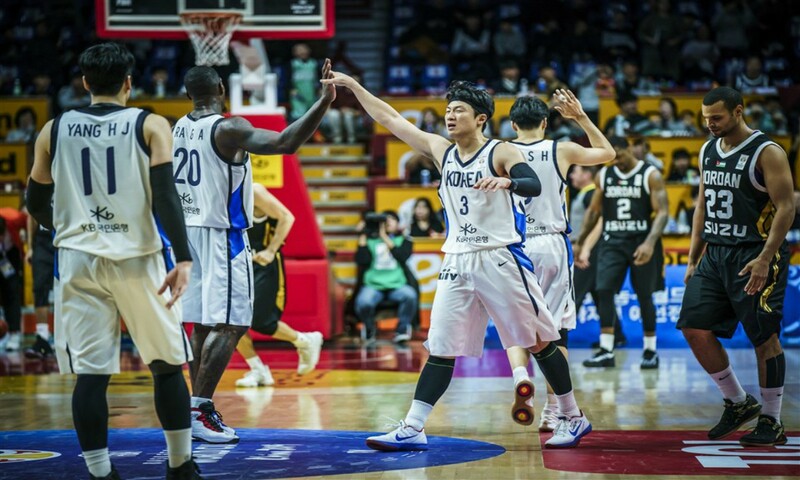 The Koreans embody all the best things about quintessential Asian basketball. Korea play fast, they use a lot of off-ball movement and all their players can shoot well from midrange extending outward. Speed and shooting, rinse and repeat. And then they added Ra GunA (a.k.a. Ricardo Ratliffe), who gives them a virtually unstoppable low post presence. Ra's strong play around the basket complements Korea's traditional strengths and actually makes them more potent. Ra took Korea to the next level in FIBA Asia, and he's the key if they'll make any sort of splash at the World Cup next year. Team Melli were not supposed to get two wins in the previous window, especially with 4 members of their starting five missing the action, but the "depleted" Iranian quintet managed to snag a win in Manila nonetheless. Behnam Yakhchali and Mohammad Jamshidi are among the finest wingmen in Asia, and during their win over the Philippines, they showed exactly why, exploding for a combined 47 points. Their next two games are going to be at home against a resurgent Japan and the seemingly invincible Australians, and though Team Melli are expected to have more of their main guys like Arsalan Kazemi and Sajjad Mashayekhi around, those will still be challenging matches. The Chinese will be playing at next year's World Cup as the tournament's hosts, but that doesn't mean they're taking the Asian Qualifiers for granted. On the contrary, the traditional Asian powerhouses have consolidated their country's best talents into one final pool in preparation for the World Cup. Since doing that, China won both their fifth window matches by an average of nearly 35 points, and they are looking to end their Asian Qualifiers campaign on a strong note in February when they take on desperate Jordan and also-ran Syria. China, at full strength, certainly remain among the best teams in Asia. The Akatsuki Five have not lost a game since February, and should they win both their outings in the final Asian Qualifiers window, then that would mean 12 months of being unbeaten in international basketball. That's a night-and-day transformation from the team that started their Asian Qualifiers losing their first 4 games, and though it's easy to say that it's all because of rising stars Rui Hachimura and Yuta Watanabe and new naturalized player Nick Fazekas, it's also because of how they team has really become more well-adjusted to the international brand of play. Much of it is also because of renewed fan support, with Japanese basketball fans filling arenas and devouring all manner of content about their team. After a sensational first round in the Asian Qualifiers, the Cedars have stumbled in the second round, losing 3 of their 4 games so far. The result is now their backs are against the wall when it comes to qualification, and they need to win both their final window games to really push their tickets to the World Cup beyond any level of uncertainty. That's easier said than done, of course. Despite playing at home this coming February, Lebanon are to square off against New Zealand and Korea, which are the top two teams in Group E. The Cedars lost to those two sides earlier in the second round, and it'll be interesting to see if their can pick up at least one win to keep their World Cup hopes alive. Team Pilipinas had a golden chance to put their foot in the World Cup door during the previous window, but they muffed those wonderful opportunities at home. A shocker of a loss to Kazakhstan and losing steam against Iran deflated the Philippines' morale and put their once promising World Cup odds at risk. Now, the Filipinos are scrambling for any ay to help increase their chances of making it to China 2019. The very recent confirmation that Andray Blatche will return to the national team in February is a shot in the arm, but there are still important decisions for head coach Yeng Guiao. Will he stick to his current pool of players, or will he re-activate some old reliables? Will he tweak his system, or not budge at all? The Steppe Wolves have not had much to smile about since winning 3 of their first 4 Asian Qualifiers games. Starting in June of this year, the Kazakhs went on a downward spiral, losing to Iraq, Iran, Japan and Australia before snapping their skid with a famous upset victory over the Philippines in Manila. It also catapulted erstwhile underperforming center Alexandr Zhigulin to the spotlight as he is now considered the new face of Kazakh hoops. They need so many things to go their way for them to even have a sliver of hope to qualify for the World Cup, but their impressive showing in the previous window along with the activation of naturalized player Anthony Clemmons have given them a boost. Much has been written about the shocking losses of the Philippines in the previous window, but the most interesting fall from grace in the Asian Qualifiers has actually belonged to Jordan. The Falcons finished their first round with 5 wins in 6 games, but they haven't tasted a win since then, dropping four straight matches to tumble of out the top 3 in Group E and move within a whisker of getting eliminated from World Cup contention. Blowout losses to the Tall Blacks and the Koreans in the fifth window are also alarming, and though the Falcons return home for the final window in February, they will still be hard-pressed to come out on top against World Cup hosts China and Group E top seed New Zealand. Spoilers - that's all that Al Annabi can really be at this point. Lopsided losses to Japan and Australia finally doomed their chances to qualify for the World Cup, and it's a pity that their last two Asian Qualifiers home games will not hold much meaning, at least for the Qataris themselves. Of course, if they do end up beating either the Philippines or Japan, it'll create seismic ripples across the region, but as far as Qatari basketball goes, those will be empty victories, if at all. If anything has been stark about Syria in the second round, it has been the vast difference in talent and quality between them and the rest of the top half of Asian hoops. Every single loss Syria have absorbed in these Asian Qualifiers has been a blowout, and that cannot be good for their morale. It also doesn't seem like they have any tantalizing rising stars or naturalized players who can stem the tide moving forward, so the horizon doesn't look too bright as well. As painful as it is to say, hard times are here to stay for Syrian hoops.